can somebody explain to me wat does "arcsin" "arccos" "arctan" mean ??? They are the inverse trig functions. So the inverse of sin is arcsin, etc. I'm not 100% sure exactly what you want to know about them. well i suppose you are familiar with sin, cos and tan. Its just the inverse function of those. What level are you at GCSE i assume? Not to be confused with cosec x, sec x and cot x... 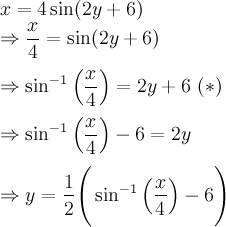 Which are 1/sin x, 1/cos x and 1/tan x respectively. When you have f(x), its inverse function [f^-1(x)] is f(x) reflected in the line y=x. Arcsin, arccos and arctan are the inverses you get on the calculator, where it says sin^-1, like everyone else has said. However, in this case ^-1 doesn't mean 'one over...', it's just a way of writing the inverse function. I know this bit confused me when my maths teacher tried to explain the difference - hope it's of some use! sorry for butting in but i was about to post a thread relating to this topic but since there's already one, how are and arcsin different? when would you use arcsin instead of ? (b)	Given that , find in terms of . = but then it gives as the final answer ...which just made me ridiculously confused. You've got it in terms of ; you need to rearrange to get in terms of . Essentially, arcsin, arccos etc. are the buttons you press on the calculator for solving something like sin x = 0.5, so you do arcsin [sin^-1] and get x=30. cosec x is 1/sin x, and I think you'd tend to use this one in trying to solve other equations where you might need a trig identity. Then substitute 8cos(2y+6) for the expression in terms of x and simplify! and then divide by 2 and minus 6? ha something went wrong...sorry, i still can't work it out! No no no - you can't split up sin(2y+6)!!! There's no such thing as 4sin!! hahaha oh the shame, i'm sorry, i'm just a bit **** at grasping most mathematical concepts! thanks for your post above, it is the right answer! but the stage just before it in the mark scheme gives and i'm just a bit stumped as to how to get there? I put a (*) next to the one that you need, because you can just replace 2y+6 with in your answer (which gives you the same as what the actual answer is). is this C3 or C4??? Maths C3 - Best way to draw Inverse Trig Graphs? ?